A few years ago, I had the pleasure of working my way through The Artist’s Way: A Spiritual Path for Higher Creativity, by Julia Cameron. I say work because The Artist’s Way is hardly a simple, leisurely read — despite the joy you might find in soaking it in. Instead, it’s set up as more of a course, with ideas to try and tasks to complete along the way. Festive expeditions filled with mischief that spark whimsy and encourage play? If that doesn’t sound like heaven for the creative, I’m not sure what does. But what I love most about The Artist Date is its focus on using play to replenish our inner well. As an artist, but more particularly as a creative, I’ve realized the importance of play more and more with each year that goes by. Our creativity simply cannot be fully cultivated in front of a screen or constantly focused on a canvas. Yet in a get-stuff-done society, play often gets neglected due to the invisible obligation we creatives seem to have to that which doesn’t stoke our fire: screens, emails, and other distractions. And the good news is, while the sandboxes and swingsets may have evolved into long nature hikes or robust novels, play is hardly reserved just for children. Play is the fuel for when your tank is running on empty. It’s the invitation extended to external influences that bring our inner most creativity out. It’s the proactive approach to keeping our wells filled. As last year came to a close and a new year started, I went on a bit of a personal mission. The objective: Inspiring as many of my clients, colleagues, and friends to make the appreciation of time a priority, and to make the most of every minute we’re given. This comes in many forms: Presence in the company of others, courage and braveness in our own work, and, perhaps most urgently, vigorous insistence on incorporating play into every day. 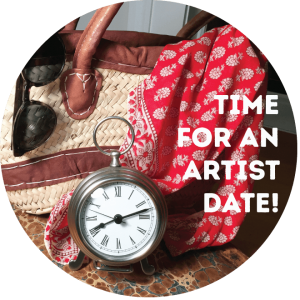 I want to encourage you, my fellow creative, to make time for yourself by adopting your own weekly Artist Date. It doesn’t have to be an extravagant affair — for me, my Artist Dates might include going to the museum, visiting galleries, taking nature walks, getting out on the ski slopes, browsing an antique shop, or taking a couple hours to walk through the library. The most important thing is that you’re taking time for you. Selfish? Hardly. When we take time for ourselves — time to play and enjoy the wonders of the world around us — we are able to be more present, courage, and brave in our relationships and in our work. After all, I’m much better equipped to create inspiring designs for the travel and tourism entities I work with when I’ve actually explored their towns, dipped a toe into their lakes, and had conversations with their community members as I dine in their restaurants. Likewise, I can take on the Bristol Mountain Ski Resort brand in an amplified way when I’ve actually got out and experienced that downhill thrill, the lights that brighten the path at night, the piercing cold hitting your face, and the purity and freshness of the air as the chairlift climbs. Call it play. Call it an Artist Date. Call it a mind break. No matter what verbiage you choose, I urge you to put an appointment on your calendar for each week, making time for yourself. Your creativity is counting on it. What will your first (or next!) Artist Date include?